This turn-key 3 bedroom semi- detached property with a large extension to the rear provides spacious and bright living accommodation. 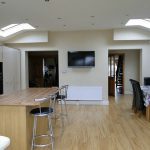 The impressive kitchen/living room with sky lights fitted lead into the dining room with double doors separating the dining room and the sitting room. There is also a utility off the kitchen with shower room. Patio doors open onto the garden. Upstairs are 3 good sized bedrooms and Family Bathroom. This home is in superb condition and beautifully decorated throughout. Viewing is highly recommended. Accommodation: Entrance Hall 20′ x 6′ Solid oak flooring. Sitting Room 15′ x 12′ Solid oak flooring, newly fitted insert stove with marble surround and back boiler fitted, large window overlooking front. 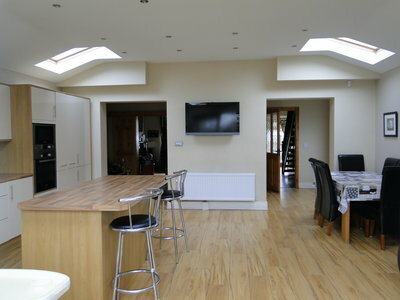 Kitchen/Living Room 20′ x 19′ Solid timber flooring, shaker style kitchen units fitted, patio door leading to rear garden. Utility 8′ x 4′ Porcelain floor tiles, built in units. Shower Room Floor and walls tiled, electric shower fitted. Dining Room 12′ x 11′ Solid timber flooring, double doors to sitting room. Bedroom 1 15′ x 9′ Carpet floor covering, built in wardrobes. Bedroom 2 15′ x 10′ Carpet floor covering, built in wardrobes. Bedroom 3 9′ x 8′ Carpet floor covering, built in wardrobes. Bathroom 7′ x 6′ Floor and walls tiled, bath fitted. Previous Listing18 Carberry House, Ard Ri, Dublin Rd., Athlone.Next Listing54 The Glen, Coosan, Athlone.